Where are seasons 2 & 3 on VHS? Where is Chef on DVD? The two questions shown above are the single most asked questions (other than the recipe for Guinness Punch) that I get asked running this website. 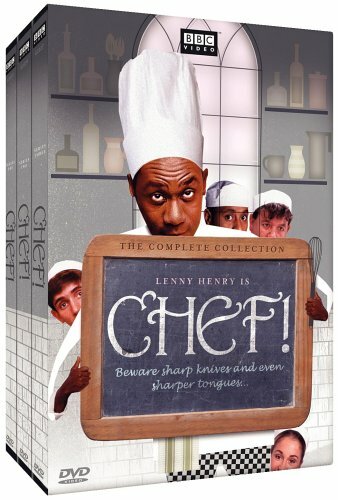 Chef on DVD: The Complete Collection was released on DVD in August of 2005. For further details on the release, please see my news page. You can now order the DVD with the links below. Chef on VHS: As of the last update of this page text (February 2005), there have only ever been two VHS videos released of Chef, and given the phasing out of the VHS format, I'd be surprised if any more are ever released in that way. They're listed below (along with a Lenny Henry Show video). THAT IS IT. Series 2 & 3 have never been released on video. What makes it slightly more irritating is that the Xmas episode from Series 1 is not on either Series 1 video. I know that technically it's a standalone special, but it has the same cast as Series 1, so it can be regarded as such. That's it. Only two VHS videos comprising 6 of the 7 episodes from Series 1 have been released. Please note that if you are going to buy any videos or DVDs, please use the links on this page. I get a small percentage of the sale from that from Amazon.com, and it helps keep the site going. Thanks. Also, all of the videos linked here are NTSC videos (which means they can only be played on North American VHS players - or a compatible system). Also, DVD's linked here are Region 1 (same restriction, generally). Let me start off by saying that I'm a big fan of Chef. I run a Chef fan website, and have done so since August of 1996, before the third series of the show was aired. I know these episodes like the back of my hand. This show is utter brilliance. There's little weakness here. If that's the case, then why didn't I give this 5 stars? 1) A text based description of some of the careers of the three lead actors (Lenny Henry, Caroline Lee Johnson, & Roger Griffiths). 5) A bunch of trailers for other British Comedy series on DVD. That's it. No text commentaries, no audio commentaries that are so prevelant these days on DVD sets. I would have loved to have heard Lenny Henry, Roger Griffiths, or any of the other actors talking about the episodes. Commentaries are a great way to get additional value out of a set, and much more enjoyment for fans of the series, like I am. You know there has to be more material lying around the vaults than that. Lenny could have done a commentary for each episode, or saving that at least a couple. The fact that the set is barebones really leaves a bad taste in my mouth. Additionally, there is an error in the packaging. If you look at the external box for the set which has all three DVD's in one package, the list of episodes for Series 1 is missing two. Some promotional materials claim there are only 18 episodes in this set (including Amazon's own incorrect listing information at the time of launch of this set). However, I've looked - there are definitely all 20 episodes of Chef! in this set. Disc 1 does indeed have all 6 episodes plus the Christmas Special. But enough about the DVD's themselves. This show is one of funniest British comedies I've ever seen. Chef! is a show about a cook named Gareth Blackstock (Lenny Henry) who is the head chef at a restaurant in England the Chateau Anglais. Gareth (usually just called Chef on the show) is a very good, extremely good cook, and is not afraid to show it. He is married to a woman, Janice Blackstock, and together, the two of them run the restuarant (in the first two series - In Series 3, the arrangement is a bit different). The show is based around their life running the resturant, and Gareth's rather overzealous and very loud personnel management of the people in his kitchen. Gareth, while the best cook in England (or so the show says, anyway), is an extremely high strung person, and loses his temper constantly. It's very funny when he does, and they actually manage to convey very strong emotions while staying away from actual swearing. Part of the thrust of the comedy here is that Gareth is so sure of himself, and blunders into situations and has to get himself out of them. That's the best way I can think of to describe the show. Gareth doing his rants reminds me a lot of Basil Fawlty and his rants. There's a certain controlled "out of controlness" to the comedy here that appeals to me. This show is incredibly funny, if you like British Comedy at all, you'll really enjoy this. Even if you aren't a big britcom fan, I urge you to check it out. I think you'll like it. Some of my favorite episodes are "The Big Cheese" (Favorite overall), England Expects, & Paris? Jamaica?. Series III takes a hit from some fans, but that's because it's not exactly like the first two. In Series 3, a bit more attention was paid to character interaction than it was in the first two series. It has a different feel, but I think it's stronger for that. The first of the two Chef! videos released by CBS/Fox, this tape contains the first three episodes of Series I, "Personnel", "Beyond the Pass", & "Subject to Contact". The second of the two Chef! videos released by CBS/Fox, this tape contains the other three episodes of Series I, "The Big Cheese", "Fame Is the Spur", and "Rice and Peas". This video is a collection of skits and stand up comedy from the brilliant "Lenny Henry Show". I've also decided to list some other related British comedies you might be interested in. Thanks to an association with Amazon.com, the Earth's largest bookstore, you can now purchase Chef! videos over the Internet! If you'd like to purchase a book or a video, click the "Order This Book" link, which will take you right to Amazon's ordering area for that particular book/video. If you have questions about Amazon's ordering, please contact Amazon Order Info. Did you know that Amazon.com offers gift-wrapping, lets you add a gift message, and will ship books anywhere in the world? They can. If you know a friend who likes Chef!, but may not have access to the Internet, you can order videos for them here, and have them shipped directly to him!